← Stocking Stuffer Ideas for Men! The Holiday season is one of my favorite times of the year but it does come with its stresses. A big one that I struggled with as I started working in the real world (in a real cubicle with real co-workers) was appropriate for gift giving in the office. You don’t want to go bananas and buy for everyone but you also don’t want anyone to feel left out. If you are absolutely certain that you do not want the gift giving to stop at the office, a safe bet is just do small gifts for the people you work the most closely with (as well as the boss man or woman). In my opinion, it would be ridiculous to spend more than $20.00-$30.00 on an office gift for a person; you can easily get away with spending less! 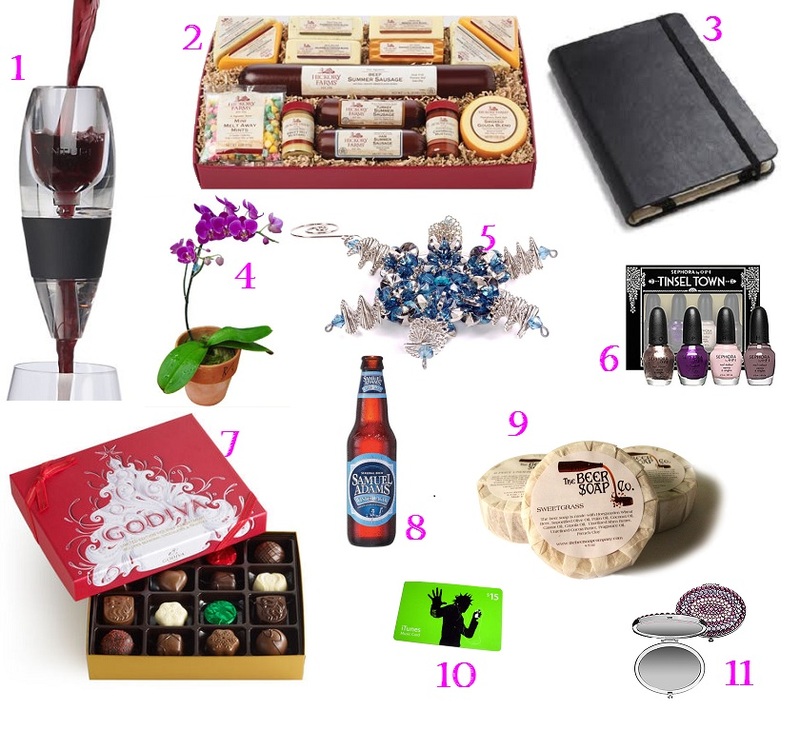 Below are some of my cost-effective office gift ideas for men and women alike! Wine Aerators are great gifts for men and women; they are simple, easy, and if you caught wind that someone likes a glass of vino or two, this is an easy solution with a personal touch. Also easy to find, just google it! Crate & Barrel, Target, and Amazon are good places to search. Meat & Cheese boxes are great for all, especially men. Hickory Farms is famous for this stuff. They have boxes from as low at $20.00. A Moleskine notebook is great for anyone. You can pick them up at any office or stationery store. Also, visit their website because they come in a lot of different varieties other than the classic black. Orchids are great gifts for everyone, especially at the office. They are gorgeous and are actual living, potted plants. So, they won’t go dying on you (unless, of course, you completely neglect it). A great site with care instructions found here. Ornaments are a total no-brainer for those who celebrate Christmas. You can play it safe with something generic or you can get elaborate and whimsical depending on the person you are shopping for. An easy gift for gals is a nail polish set. Sephora makes this really easy as they have multiple sets and options ready to go as gifts. Chocolates are always a go! Everyone in the office can appreciate this; instant gratification doesn’t get any easier than Godiva! A seasonal alcohol is often a good route to go, especially with the guys. A 6-pack of Sam Adams Winter Lager with a bow attached: voila! Perfect gift for the guy across the hall. From beer to more beer….Beer Soap is something that I just recently came across and think it’s a great little gift as well as a perfect stocking-stuffer. Gift cards are super safe and easy. iTunes is basically universally accepted as well as Best Buy, Target, etc. A glitzy compact is a definite go-to for any lady (or gentleman) in the office. This one from Sephora keeps you on budget and is very cute! Stocking Stuffer Ideas for Men!